Social commitment is an integral part of our corporate philosophy. We focus on the health sector. 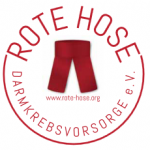 We support the non-profit association Rote Hose Darmkrebsvorsorge e.V., in order to to raise the profile of colorectal cancer and to promote and encourage increased awareness of the symptoms and prevention of the disease. For further information please visit rote-hose.org.